Whether you're at the beach, lake, park or the mountains, keep the party alive with an original Whamo Frisbee disc. This is the brightest Glow-in-the-Dark Frisbee ever! It glows more than 30 minutes. Play all day, fly all night. All you have to do to make it glow is expose it to direct light for 60 seconds. No batteries to charge or to weight down your throw. Let it fly! Whether you&apos;re at the beach, lake, park or the mountains, keep the party alive with an original Whamo Frisbee disc. This is the brightest Glow-in-the-Dark Frisbee ever! It glows more than 30 minutes. Play all day, fly all night. All you have to do to make it glow is expose it to direct light for 60 seconds. No batteries to charge or to weight down your throw. Let it fly! It&apos;s a Frisbee Disc by day or night! DYN-O-GLO glows brighter and longer than any other discs. New graphics - holograph rainbow foil hot-stamp! 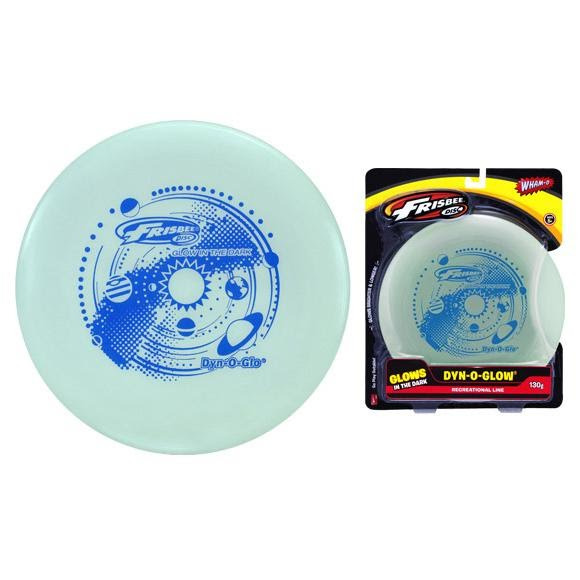 The Frisbee - often copied never duplicated - is the original flying disc. It features the Frisbee flying concentric rings which stabilize the flight pattern, reduce the drag, elongate the air time and maximize the throwing distance. Try doing that with just any plastic disc.